While on the boat, we are chilling and admiring at the view, anxious to flow under the bridge. We are not too far from it, we can see it in the distance, but something strange seems to happen. All of a sudden the boat immobilizes, as if someone closed the tap and there is no more water running in the river. We stay there looking at each other in wonder and after about 20 minutes more or less the boat slightly starts to move again only it does not flow to the sea anymore but... backwards! No! That's pretty normal... for this river! 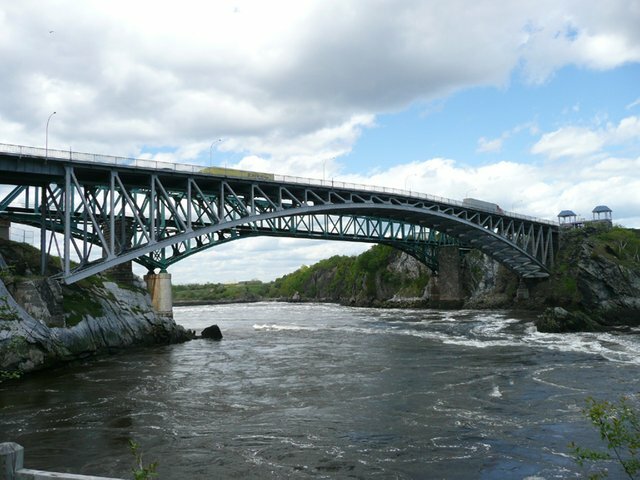 You see Saint John river, which flows through the city of Saint John (New Brunswick, Canada) is a very special place where the waters of the river meet with the tides of the Bay of Fundy in a confrontation where the strong man wins! Enough with the metaphors, please. Pfff, ok! 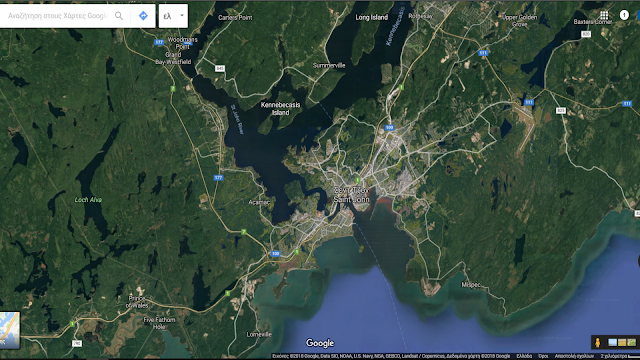 In plain english: the tides in the Bay of Fundy push the river flow backwards. For a 20-minute period the two forces seem to be neutralized and the waters stand still. But the high tides keep flowing inside the bay, gushing into the river and flowing as far as 130 kilometers inland. Twelve hours later, the high tides begin to lower down until they fall below the river water levels, there is another moment of total balance and tranquility before the low tides retract, allowing the river to flow normally towards the seas again. And in case you are too afraid to go on a boat ride on this river, you can always... fly! βγαινει η δασκαλα απο μεσα σου ε?? ?...ειπαμε πηραμε καλοκαιρινες διακοπες....απο Σεπτεμβριο βλεπουμε!!! I'm probably retreading stuff you've already done and I've forgotten about, but you can try looking at stuff in space or deep under the ocean. Or you can just switch to mundane natural phenomena (RAIN!, WIND!, or the SUN!). I have some underwater phenomena bookmarked for my list and I'm always on the lookout for anything "weird"
Hello! By this link https://www.currenttime.tv/a/28579809.html, you can see an interesting video. The cars roll themselves uphill, the stream flows uphill. This place is in Armenia and is called the Aragatsotn anomaly. Of course it’s an optical illusion. The surrounding landscape makes the objects appear to defy the laws of physics however, if you take the exact geographical circumstances into account it’s merely a parlor trick. Do the cars really defy the laws of gravity/physics? I think the road only appear to be downhill when in fact they aren't. It is rather an optical illusion. We have on eon Olympus, I have been there several times but I haven't felt anything weird. Wonderful post Ruth. The video really showed everything how beautiful the river is and watching closely how it reverse in the opposite direction . So beautiful and amazing. I was thinking of your thoughts during that 20 minutes that the boat was standby. What were you thinking? If it was me I would be thinking of a plan B. Seems like such incident can make one hungry :) next time go with a packaged food. Hey my country made it to one your your posts. Cool. The Maritimes are great place to visit but really only in the summer. The Bay of Fundy is amazing with the tide going really far out and then really far back in. The largest slosh basin in the world. Wow, you did an excellent job explaining this. There are many places in Canada that are tidal. Where I live, the tides easily change 12 ft, so when we had logging camps down the coast we had to be aware of slack tide in order for the crew to leave camp. It was my job to fly a Robinson 22 helicopter (2 seater) and make sure the crew in the boat were a)headed the right direction, as it's easy to get turned around (and yes, I've had to hover at sea level in front of the boat and physically wave my arm and point which direction they needed to go :), and b) make sure they safely got home without a breakdown. Great post! Honestly I love this 😄, it gives me topic of discussion with my colleagues most times, especially when boredom sets in. Wow Ruthie! This post has answered the many questions I had about rivers flowing downwards. I'm having trouble even imagining an 11 m tide. When I lived near the coast, it was maybe 30 to 50 cm at most. For reference (and because I know you like whirlpools and youtube videos), a 1.7m tide going through a constriction causes the Naruto whirlpools. I believe (without having read anything about it) that it's because the river is a lot more "constrained" unlike the sea, so the big height difference must have to do with the morphology of the place. I haven't heard of this before... A flow in the forward direction, then a break, after that, a flow in the backwards direction.. One should not trust this river at all.. Lol.. Imagine trying to elope with your girlfriend, when you think you have covered a distance, the river carries you back to the starting point, were the girl's father is waiting for you with a cutlass in his hand. You are a great writer @ruth-girl. Thanks for writing this. Oh! Oh my! This sounds like a lover's nightmare!! Knowing that a water body can flow against its normal direction is entirely new to me. The world indeed is so full of natural wonders..
Weird things happen out there, don't you agree? Hmm. I never knew such place and River exist. Well we've heard alot of more mysterious things. so i am not really surprised. Glad i was exposed to this here. It's not as weird as bioluminescence, but it is pretty awkward.